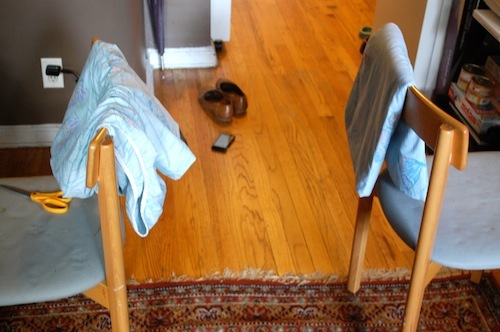 It’s 2 chairs (just dining chairs) with folded linens over the tops (I started without but it hurt my hands). It is a little bit short for me but I made sure that I didn’t hunch and instead just bent my knees when going to grab the backs of the chairs for the air crunch. I don’t know what the pair of scissors is doing there. Bobby must have used them last night for something. Last summer at my wedding (bride + maid of honor). 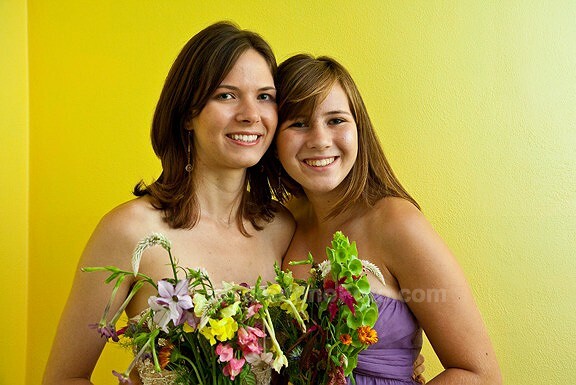 Handmade and handpicked bouquets from the organic farm she works at. P.S. It’s my sister’s graduation from high school today! Congratulations Julia!! Cracking up b/c CD was a math/econ major, and he does the exact same thing! He makes everything he does as efficient as possible, and I am the exact opposite – haha, totally need that boy in my life! Very disappointing. I thought I was going to be reading about food dips – mushroom dip, onion dip, maybe a little crab dip – while eating my ham and cheese sandwich. Oh well. i think you beat me on pushups and knee raises by a couple! i have like no upper body strength haha. i bet your yoga-ing helps out. i’m getting stronger every day! Your dad’s comment made me LMAO!! ME too! Your right – best comment ever from your Dad! Previous PostPrevious Manna Bread Review – What is Organic, Sprouted Manna Bread? Next PostNext 108 Sun Salutations, Burpees, and Pain au Chocolat… Manger Bouger?